So, what method do you use to get the labeling off the rear derailleur? I’ve been wanting to remove the “Ultegra” from my Ellis derailleur. Wasn’t sure how to do it. Well, Doug, I’m not sure how to do it either. I think I read somewhere about the stuff you see in the photo above, found it in a hardware store, and tried using it on something. 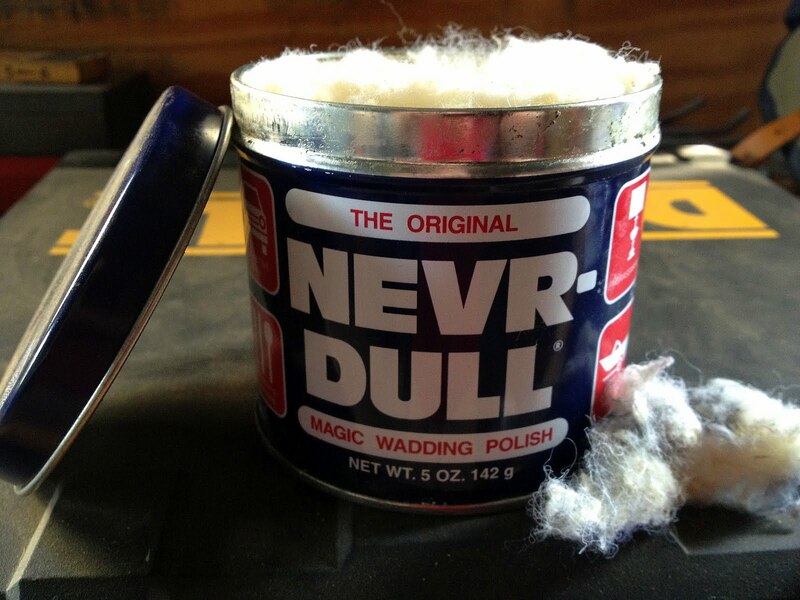 It seems to be useful stuff for very light polishing. For example, I peeled the VO sticker off my fenders and a sticky residue was left over. I took the fuzzy stuff and polished it right off. When I marked my fenders with a Sharpie and had a few stray marks to clean up, the fuzzy stuff performed well again. So why do I hesitate to answer Doug’s question with authority? Shimano component logos seem to be much more stubborn. If you examine the final results of my “105” removal closely, you’d see that a vague “shadow” (I’ll call it) is still slightly visible. You’d also see a difference in the finish in the area I did most of the rubbing as compared to the rest of the part. Maybe Shimano has some kind of clear coat finish on their shiney components or something. It took probably 20-30 minutes of consistent rubbing to get to what I deemed “done”. A lot more work than the two examples provided above. I’m not sure that I’d recommend using this same approach to everyone. But for me the results were satisfactory. From 5-6 feet away, it looks like a shiny label-less component. Since my bike is never again (Sorry, Mitch) going to look like a showpiece, that totally works for me. But it might not work for you. Anyone out there got any other suggestions to help me and Doug with future logo removal projects? Nothing to say of any help but I might pick up a can of the stuff pictured here.Good lunch, fellows. Um, I mean luck, not lunch. Interesting. I don't think I'll invest 30 minutes of rubbing time to remove my logos. Most likely it would flare up my tennis elbow. But I'd be interested in hearing any other methods. I've seen it done a few times on other blogs, but never asked how it was done until now. The front derailleur was easy, it was a sticker. The rims were easy, also stickers. But that derailleur logo is much different. Was there any "magic" to the Magic Wadding Polish"? Didn't really sense the magic, in the sense that it still takes effort.That said, it is handy to have a tin of moist, fuzzy cloth, saturated in polish that one can grab quickly, tear a piece off and start to work. I'm certainly no expert either (nice to feel like I'm in good company) but I have used that stuff to clean up rust spots from chrome, to decent effect.I suspect that to the extent it worked on the sticker residue and the stray marker marks, it is due to the solvent conent in it. For stuff like that, I first try 'methylated spirits' (a.k.a. marine stove fuel and what I burn in my home-made sodacan stove- ethyl alcohol/'ethanol' with some methanol added so folks don't drink it: methanol metabolises to formaldehyde in your liver, if I recall correctly. Use gloves, as it can absorb through your skin and have the same effect, although far less than if you drank it.) I likewise think I've read that the alcohol 'denatures' (?) the adhesive.After that, I try 'white gas' a.k.a. regular camping stove fuel.If the one isn't strong enough, the other usually is.As far as those logos, I have no idea how to get rid of them. Seems like they are part of an anodizing-like process and that, indeed, you cannot be shed of them without also affecting the finish in a minor way.Have at 'er!